Some call plum ‘Opal’ the most delectable of all fruit. This cross between the delectable gage variety ‘Oullins’ and the cultivar ‘Early Favorite’ is considered by many to be the best early plum variety. 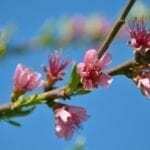 If you are growing Opal plums or want to plant Opal plum trees, you’ll need to know more about this fruit tree. Read on for information and tips on Opal plum care. The trees that grow Opal are a cross between two subspecies of European plums, one of them a gage plum. Gage plums are extremely juicy, sweet and delicious, and the plum ‘Opal’ inherited this exceptional dessert quality. Opal plum trees flowers flower in spring and harvest starts in summer. Those growing Opal plums say the trees must have full sun in summer to produce the famed, rich flavor. Plum ‘Opal’ is a medium-sized fruit with mottled skin and golden or yellow flesh. 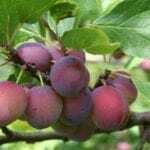 These plums mature over a few weeks, rather than all at the same time, so expect to harvest more than once. If you start growing Opal plums, you’ll find that the fruit is excellent eaten fresh. These plums also work well cooked. Plums last about three days after picking. 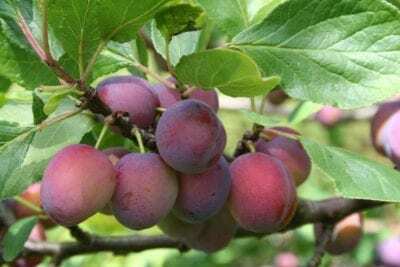 Opal plum trees are easy to grow but the fruit flavor depends almost entirely on whether the fruit sugars have time to develop over its short growing period. You will do best growing Opal plums in full sun if you are aiming for that intense flavor, and a sunny site makes caring for these trees even easier. Caring for Opal plums involves much the same effort as for other plum trees. The trees require regular water to establish, then irrigation during the fruiting season. From the time you plant, you’ll have to wait between two and four years to get a good harvest. Fortunately, Opal plum trees are very resistant to plum tree diseases. This makes Opal plum care much easier. Expect to do some plum tree pruning, however, to build a strong frame for the fruit.